On a Friday afternoon more than sixty years ago, a special gathering took place in a small hall in Tel Aviv. The brief ceremony, lasting only 32 minutes, concluded with the birth of a tiny state called Israel. A State Behind the Scenes is a ‘last chance’ opportunity to see the backstage events of May 14th, 1948 which lead to the signing of the Declaration of Independence resulting in the creation of the nation-state for the Jewish people. 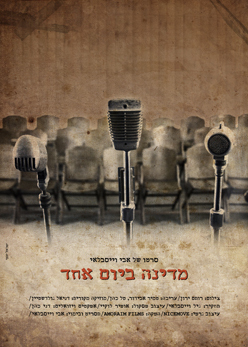 The viewer gets to meet witnesses of the ceremony who recreate the event by revealing rare documents and fading photographs depicting the moments that made history then and influence Israel now.